The complementary colors of orange and blue are everywhere this fall season. And why not showcase these happy colors with a blue belly cat? A bit of doodling the other day prompted a quick contour drawing of this cute cat. This lesson can be done in two steps. First, draw the contour cat with a sharpie on watercolor paper. Then paint the cat and background. Second, after the paint dries, add the pattern and lines. Use the drawing handout as a guide to draw a contour line of a simple cat. Focus on drawing two ears, a head, a long neck, hunched shoulders, simple paws and a long, curvy tail. Don’t worry if it doesn’t look perfect. The fun part is drawing wonky lines! Draw two oval shapes for the EYES. With a white crayon, trace carefully along the outside of the black marker line. With a brush, touch the blue paint and dip into water so the clear water has a tint of blue. Brush water inside the contour line. With BLUE paint, start painting a LINE of color along the bottom of the cat. Hold paper upside down so that the blue drips and mingles towards the body. Continue painting the cat blue, allowing the paint to migrate down the paper using gravity. This is really fun for kids as they can see how the colored paint will travel to the wet areas. After paint dries, use the black marker to add a NOSE and a MOUTH. Fill the cat with patterns, lines and shapes. 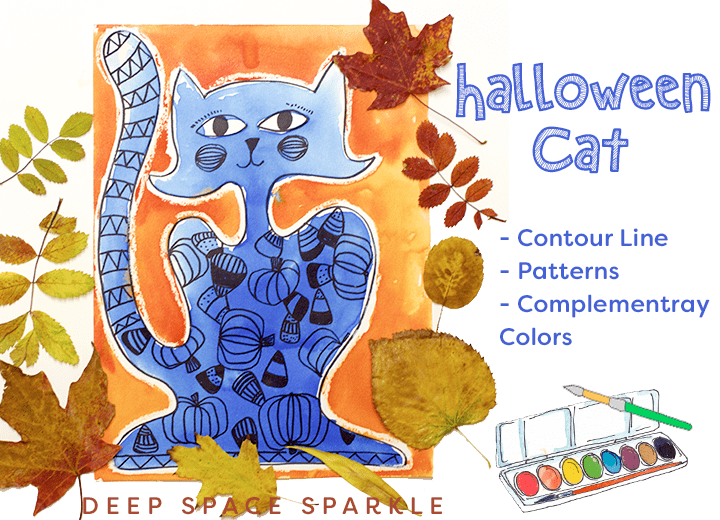 – Draw cat on colored paper using the instructions in the PDF or from the instructions above. 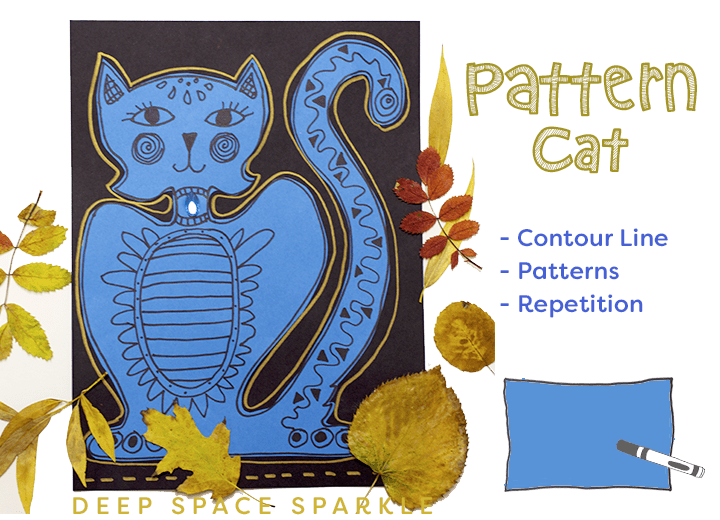 – Add patterns inside the cat. Cut cat out and glue onto black or any other colored paper. – Use a gold or metallic sharpie or permanent marker to outline the cat. The gold metallic pen really pops against the black paper. You can use a gold/metallic oil pastel if you don’t have a marker. – Detail collar with pom-poms, rhinestones, or buttons. 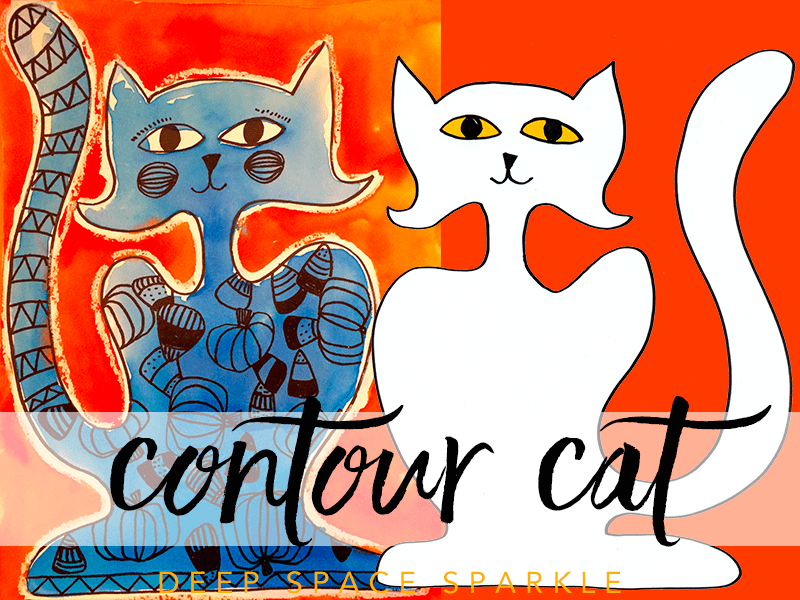 Click the image below to receive the Contour Cat Watercolor Freebie via email! For more watercolor projects click HERE. Confession: I’m completely addicted to your lessons! We homeschool and this year for art, I wanted to do something different. Usually, I use your site for most of our lessons, but this year, I bought a book for lessons. Here we are, just finished our first quarter and guess what? This last week, I *had* to pull out one of your lessons we’d not gotten to yet! Thank you for all of your hard work for this site. We’ve been followers for years and I am constantly giving out your website to homeschool groups we are in. Greetings from India. Thank you for the wonderful art lessons, they are very very handy. I teach a group of kids age 4 to 7yrs at home, they really enjoy these art projects. Discovered your site a couple of months ago and am almost addicted to it. A special thanks for mentioning pinterest its the most amazing app I’ve ever downloaded. Thank you! So glad you found me! I love how we are all connected through art. Enjoy the lessons. I tried this project with my grade 1 learners. It was truly amazing. Thank you. I couldnt cope without DSS. very inspiring, simple but effective lessons! Are you also creating for middleschool? I love your projects and the accompanying instructrions. Wish I knew about you when I was in the classroom, but use these in my tiny home-studio class of 8 kids 6-11 years old. They are always a hit and I know I am teaching them new art skills.